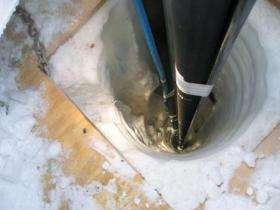 (PhysOrg.com) -- As the 2008-09 Antarctic drilling season concludes, the IceCube Neutrino Observatory is on track to be finished as planned in 2011. The observatory is an enormous telescope designed to capture evidence of elusive subatomic particles called neutrinos released by distant cosmic events like exploding stars. Built directly into the ice covering Antarctica, IceCube uses the Earth to filter out lower-energy particles and focus instead on the highest energy neutrinos that carry information about supernovas, dark matter, gamma-ray bursts and other exotic cosmological mysteries. IceCube is constructed using a hot-water drill to bore holes one and a half miles deep into the ice. Strings of optical sensors are lowered in and frozen into place. By optimizing their drilling procedures, the IceCube team installed 19 strings of optical sensors this season, surpassing the original goal by three, and still finished a week ahead of schedule. A total of 59 strings containing 3,540 basketball-sized digital optical modules (DOMs) are now embedded in the ice near the South Pole. When completed, the detector will consist of more than 5,000 DOMs spanning a cubic kilometer of deep Antarctic ice. In addition to the 80 regular strings, the team plans to install six “deep-core” strings that will enhance neutrino detection in the deepest, clearest ice. These strings, funded largely by the Swedish collaborators on the project, will use very high-efficiency detectors that will improve the observatory’s ability to detect a larger range of neutrinos. The first deep string was installed this season. The deep strings will also help replace an aging experiment at the pole named AMANDA, for the Antarctic Muon and Neutrino Detector Array. 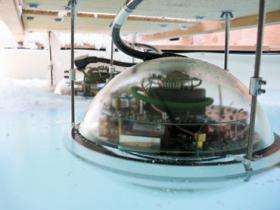 AMANDA was built more than 10 years ago as a smaller-scale experiment to “break the ice” for IceCube and has been integrated into the IceCube design. To make room for newer technology, AMANDA will be decommissioned later this year. With two-thirds of IceCube’s DOMs already in place, the scientists are already collecting and analyzing data. A small percentage of the data collected at the pole is transmitted via satellite, but the vast majority is stored on magnetic tapes and shipped to Madison at the end of the work season. Events collected during the past year are now being sorted and prepped for analysis. Initial data are being used to test and calibrate the instrument, but the scientists are keeping their eyes open for particularly noteworthy neutrinos that might signify interesting cosmic events. IceCube is an international collaboration supported by the National Science Foundation, with significant contributions from the Wisconsin Alumni Research Foundation, Germany, Sweden, Belgium, Japan, New Zealand and the Netherlands. This is really cool (sorry about the pun). Seriously though, even though these sensors are in a bit of a harsh environment, I'd argue they are easier to install and monitor than the neutrino detectors that were put into the ocean. Let's just hope there are no massive ice-faults that break these things before they report good data.